We met in Cabo San Lucas on memorial day weekend 2016. Geoff was there for a bachelor party and I was there with a group of friends just getting away for the weekend. Little did either of us know we would be meeting our forever partners out on the town in Mexico.. We spent the weekend together getting to know one another both romantically as well as with friends, but left unsure of what was next for either of us. I was living in Dallas and Geoff was living in LA. The week after leaving Cabo we began to talk daily, just enjoying each others communication for about 2 months until I finally decided to take the leap and go visit Geoff in LA, because why not! And you guessed it... the rest was history. We spent a wonderful weekend together in LA, and from there would visit each other all the time, traveling to new destinations or simply going to each others cities. Long distance has been our whole story until recently when I moved to LA to start a new life with Geoff! Engagement shoot outfit consisted of Geoff in black jeans (Saint Laurent) with black boots (John Varvatos), a white button down and blazer(Barney's NY). 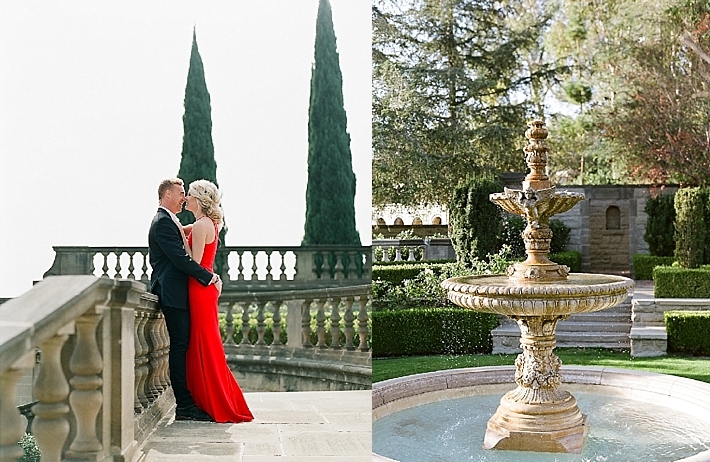 Emma wore a red dress by Badgley Mischka, and a black dress by Aidan Mattox. Shoes were beige heels by Steve Madden. Engagement ring and gold/diamond cuff bracelet were both Retrouvai. Where will you be getting married? Our wedding venue was an easy call, we looked up many places in Southern California as I (Emma) was moving from Dallas to LA to be with Geoff. Our vision was either a vineyard with stunning views, or a view of the ocean but not exactly a beach wedding. Upon finding Bel-Air Bay Club online the pictures truly stood out to us as we knew we could see ourselves being married on the lawn of the club with the beautiful ocean view. It was our last place to tour and we signed immediately. The staff there went above and beyond to inform us of all the details, and everything just felt right!